A simple homely meal, our tuna cauliflower cheese pie is unbelievably tasty and full of fantastic flavour. With the nuttiness brought out when roasting cauliflower, this is a spoon-licking delicious and easy to make weeknight meal or side dish idea, great for entertaining. 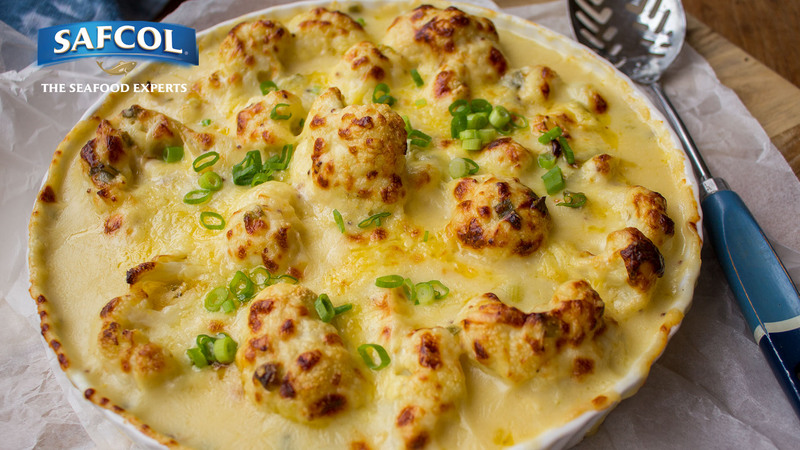 Place the cauliflower on an oven tray and drizzle with little olive oil. Roast for about 10 minutes until still firm but just starting to brown, then remove from the oven. Lightly oil an ovenproof quiche or flan dish (about 25cm across). In a large sauté pan or deep frying pan on a low heat, melt the butter, adding three quarters of the sliced spring onion and cook gently for 1-2 minutes. Sprinkle flour over the butter and spring onions and stir quickly. Slowly pour in the milk and stock stirring continuously, now turn the heat up to medium low and keep stirring until the sauce thickens and starts to bubble. The sauce needs to be quite thick and smooth. Remove from the heat, add 1½ cups of grated cheese and the mustard. Season to taste with salt and pepper and a small dash of Tabasco. Spread the tuna evenly over the base of the quiche dish, then pile the cauliflower florets over the tuna. Top with the sauce and sprinkle the rest of the Cheddar cheese. Then bake for 15-20 minutes until the top turns golden brown. Scatter with the remaining spring onions and serve piping hot, with crusty bread and a green salad.